Could this be the best standard zoom on the market? The Sigma 24-70mm Art is a fabulous lens. It’s hugely impressive in terms of build quality, handling, and the performance of its autofocus and stabilization systems. Most importantly, it simply delivers spectacular image quality. For everyday shooting, a standard zoom lens is the go-to optic for most DSLR owners, so it pays to get a good one. The latest own-brand Canon and Nikon 24-70mm f/2.8 lenses have equally fast aperture ratings and are built to satisfy the most discerning professional photographers. But neither is perfect. The Nikon AF-S 24-70mm f/2.8E ED VR is frankly enormous and the Canon EF 24-70mm f/2.8L II USM doesn’t even feature image stabilization. 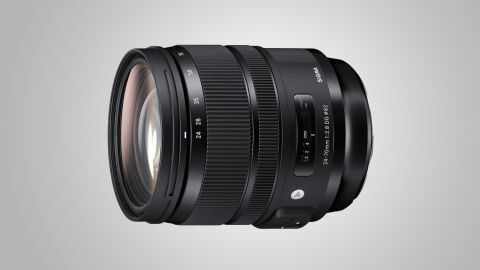 Stiff competition is now available in the shape of the Tamron SP 24-70mm f/2.8 Di VC USD G2 and this Sigma ‘Art’ lens. They both undercut the Canon and Nikon lenses for price, but certainly don’t skimp on build quality and performance. More than just an upgrade of Sigma’s old, non-stabilized 24-70mm lens, this new Art edition is a much more up-market affair. Construction is based on a metal shell and TSC (Thermally Stable Composite) parts, along with a brass mounting plate. The mount features a rubber weather-seal ring, although the barrel isn’t weather-sealed. High-end features include ring-type ultrasonic autofocus system with full-time manual override. This comes complete with a switch on the barrel to enable both auto-priority and manual-priority autofocus modes. With the latter, you can focus manually without first having to wait for autofocus to lock onto a target, which can be handy when autofocus is struggling with tricky subjects. It also means you can swap to manual focusing in continuous AF mode, simply by twisting the focus ring. The optical stabilizer has a simple on/off switch, without a secondary panning mode. Both Canon and Nikon editions of the lens have an electromagnetically controlled aperture diaphragm. It’s to be expected in the Canon-fit version of the lens, and is mostly good news for Nikon users, as it boosts exposure consistency in rapid continuous drive mode. The downside is that, as with Nikon’s latest 24-70mm lens, it makes the Sigma incompatible with older DSLRs including the D1, D2, D40, D40s, D60, D70, D70s, D80, D90, D100, D200, D3000 and D5000. Well connected, the lens is compatible with Sigma’s optional USB Dock for applying firmware updates and customisation options like AF fine-tuning. It’s also compatible with the Sigma Mount Converter MC-11, enabling the Sigma SA and Canon EF editions of the lens to be used on Sony E-mount bodies. And if you should swap your camera system from Canon to Nikon, or visa versa, the lens qualifies for Sigma’s mount conversion service. The Sigma looks and feels every inch a precision engineered, professional-grade lens. The construction is rock-solid and the zoom and focus ring operate with super-smooth precision. The inner barrel extends at longer zoom settings as you rotate the zoom ring counter-clockwise, viewed from the rear. The rotational direction matches that of Canon zoom lenses but will feel counter-intuititive for Nikon photographers. With a physical length of 108mm, the Sigma is a little shorter than the Canon and Tamron alternatives, and considerably shorter than the Nikon (155mm), which has an internal zoom mechanism so it doesn’t extend at longer focal lengths. The Sigma is marginally lighter than the Nikon, but a little heavier than the Canon and Tamron, weighing in at 1,020g. It’s certainly no lightweight, but nevertheless feels well-balanced even on relatively compact full-frame bodies like the Canon EOS 6D Mk II and Nikon D750. Autofocus is very fast and whisper-quiet, thanks to an upgraded ultrasonic drive system that has a third more torque than in Sigma’s previous 24-70mm lens. The optical stabilizer gave a 4-stop benefit in our tests, matching the performance of the Nikon lens’s VR system but losing out to Tamron’s 5-stop stabilizer. As we’ve mentioned, the Canon lens doesn’t have a stabilizer. Image quality is simply sumptuous. Sharpness and contrast are excellent throughout the entire zoom range, even at the widest aperture of f/2.8. The only noticeable dip in sharpness is at the extreme edges of the image frame, when shooting wide-open at 24mm. Ultimately, the Sigma is every bit as sharp as the Canon and Nikon own-brand lenses, and draws ahead of the Tamron at the long end of the zoom range. Bokeh (the quality of defocused areas in images) is wonderfully smooth and creamy at f/2.8, and remains very good when stopping down a little, helped by a well-rounded nine-blade aperture. Colour fringing is minimal, even at the corners of the image frame. In this respect, the Sigma easily beats the Nikon lens, is slightly better than the Canon, but marginally less excellent than the Tamron. Distortions are also very well controlled, performance being on a par with the Canon and Tamron lenses and slightly better than in the Nikon. Resistance to ghosting and flare is also very good. The Sigma 24-70mm Art is a fabulous lens. It’s hugely impressive in terms of build quality, handling, and the performance of its autofocus and stabilization systems. Most importantly, it simply delivers spectacular image quality. There’s no getting away from the fact that it’s a heavy lens, but that’s par for the course with f/2.8 standard zooms for full-frame DSLRs. Unless you’re desperate for a full set of weather-seals, rather than just having a sealed mounting plate, we can’t see any good reason to spend more on own-brand Canon or Nikon lenses. A tougher choice is whether to go for the Sigma or the slightly less expensive Tamron G2 lens. The Tamron has more extensive weather-seals and a slightly more effective stabilizer, but the Sigma edges ahead for image quality, especially in terms of sharpness at the long end of the zoom range.